Brazil is home to thousands of Amazon rainforest animals, each unique in their own special way. It's amazing to think about the fact that nearly 60% of the rainforest is in Brazil and in that part of the Amazon rainforest reside almost 1/10th of the world's animal species! This beautiful country is diverse in their culture, music, food, and also their animal life. Many researchers and scientists believe there are still hundreds if not thousands of species still to be discovered in the Amazon! There are nearly 3,000 various species of freshwater fish in the waters of the Amazon rainforest. And several other varieties of carp, cichlids, tetras, piranhas, and catfish. These are just a small sampling of the thousands of fish in the waters of the Brazilian Amazon! Just over 600 species of mammals have been discovered so far in the Brazilian rainforest. Here are just a few! The Amazonian manatee is Brazil's largest water mammal weighing in at 1,000 to 1,200 pounds. A few weighing as much as 3,000 pounds have been found! They can reach eight to ten feet in length, which means if they were able to stand, they'd be taller than most people. They live in the Amazon River and the tributaries of the river. Sadly, the manatee is on the endangered species list. Thankfully, zoos around the world have taken in manatees in hopes of preserving the species. 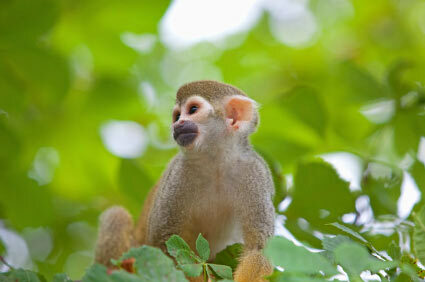 Primate mammals of Brazil include 35 species of tamarins, marmosets, and lion tamarins. Capuchin monkeys, Saki monkeys, Night monkeys, Woolly monkeys, Uarkaris, Muriquis, Spider monkeys, and Titi monkeys account for nearly 70 species of monkey alone! If you love bats, visit the Amazon rainforest in Brazil! Bats of every size are in the rainforest! There are over 1,000 bat species in this part of the world alone. I find that amazing! The Brazilian free-tailed bat is one of the smallest bats - an adult weighs a mere 0.0286 lbs. Tapirs are herbivores, feeding on plants due to the fact that their digestive system can only handle a small amount of food at a time. Here's an interesting fact about tapirs - much of what they put into their mouth travels through their system and exits out the other end undigested. Why is this significant? Tapirs unknowingly spread plant species around the rainforest! The bird species are one of most prevalent Amazon rainforest animals at just over 1,600 species in all! 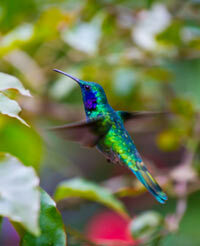 They actually rank third in the world for the number of bird species that call the Amazon rainforest home. What sorts of birds could you expect to see? Parrots of all kinds and colors for one! There are nearly 70 species of parrots in the rainforest of Brazil. Toucans, hummingbirds, penguins, vultures, trogons, swans, ducks, flamingos, eagles, hawks, rheas, owls, and tinamous are just a few of the diverse bird species living in the rainforest. This isn't even a complete list of all the bird species that can be found in the Brazilian rainforest! Brazil's rainforest contains just under 500 various species of reptiles ranging in size from one-half inch to 30 feet long! It's no surprise that the anaconda is one of the most fearsome Amazon rainforest animals given that it has the ability to swallow an entire cow and weighs as much as a horse! The anaconda uses its 30-foot body to surround and crush its prey instead of injecting it with venom. Anacondas are not venomous, but they are definitely an animal that you don't want to encounter! The caiman may remind some people of an alligator or crocodile because of the long snout and large teeth. It can grow up to 13 feet in length and has bony ridges across its snout. Caimans hunt at night preying on other reptiles, capybaras, fish, shrimp, and mammals. They live in freshwater rivers and lakes of the Amazon. Don't let the tiny size of these frogs fool you - a mere 2 ½ grams of this frog's poison can kill a person of 150 pounds! They're very pretty with colors of red, black, black and white, yellow, and green. Walking through the Amazon rainforest during the day, you might get to see them hopping along the rainforest floor hunting insects to eat. They immobilize their prey or enemies by excreting poison from their skin. We would be remiss if we didn't mention that Brazil's rainforest boasts at the minimum 70,000 insect species and at the most 15 million insect species! It would be impossible to name them all here but some of the species include ants, spiders, and butterflies, to name a simple few. Each day, more species are being discovered! One of the most interesting species of insect in the rainforest is the leafcutter ant. These are ants that specialize in growing their own fungus, or food, under the ground using leaves they cut with their sharp jaws. Once they get the leaves back to their underground home, the chew up the leaf, spit it out, add feces and fungus and voila, they have food to eat. Leafcutter ants can carry 10 times their weight on their back! These ants make a series of mounds in the earth they call home. The series of mounds of leafcutter ants can take up a lot of space - up to 6,500 square feet in some cases. Within these mounds can be up to 8 million ants! I am always amazed at the diversity number of Amazon rainforest animals there are in Brazil!